I left Florianopolis at 7AM to get the bus to Porto Alegre, there being no direct bus to Montevideo. By 9AM I was away, and I arrived timely, sometime after three in the afternoon. This is where the plans were scuppered though. Straight over to the ticket agencies I headed, only for the answer to be the same everywhere I went. There were no buses to Montevideo till at least the 2nd of January, five days away. 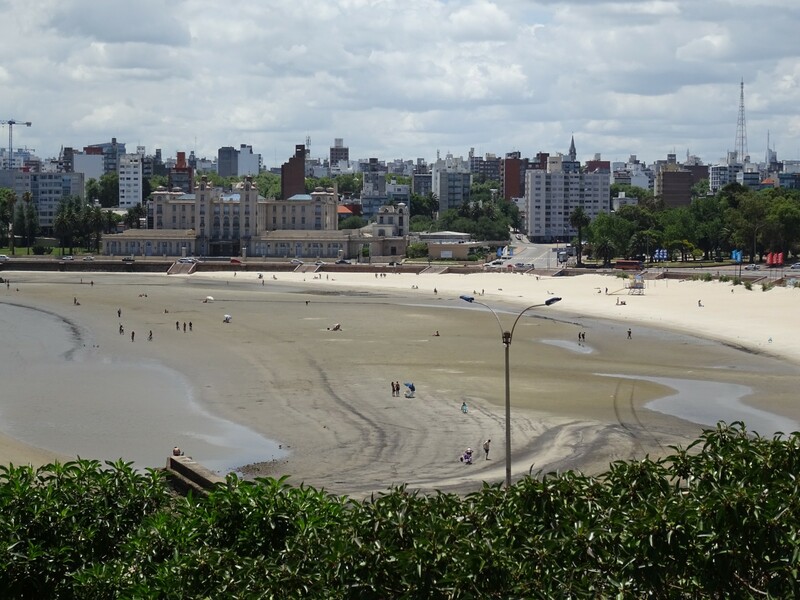 My sights were set on getting to Uruguay, and I really wasn’t looking forward to being stuck in Porto Alegre for the new year, as nice a place as it may well have been. As I went from window to window it became apparent that someone else had the same predicament. A Spanish guy, living in Montevideo, by the name of Borja. Porto Alegre bus station really is lovely this time of year. Borja and I teamed up, and at one of the other agencies found that they had buses going to Rivera and Tacuarembo, in the central north of Uruguay. The next one didn’t leave till 11:45PM though, and there was a precarious 15 minute gap between the supposed time of arrival at Tacuarembo and our would be connecting bus at about 7AM. The bus after wouldn’t leave till 12:30. It was our only option, so we could but hope. 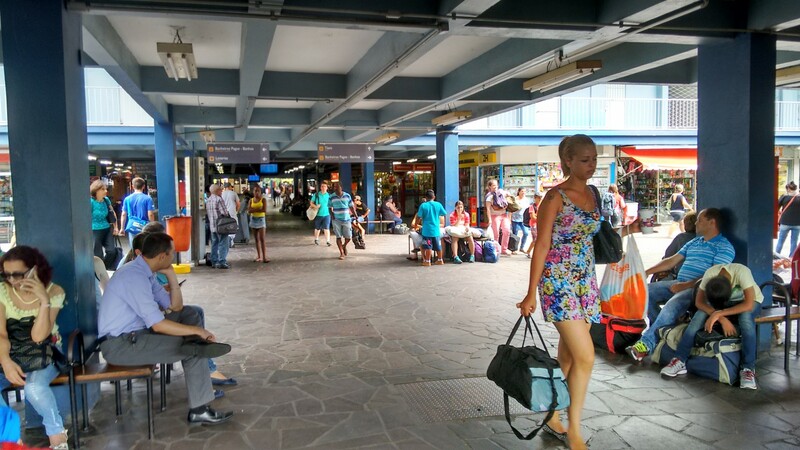 This still left us with eight hours to pass in Porto Alegre bus station – we didn’t really fancy dragging our bags around for an evening tour of the city. After some Spanish talk, reading, writing, eating and Borja pacing up and down as our bus was late, we finally got going. 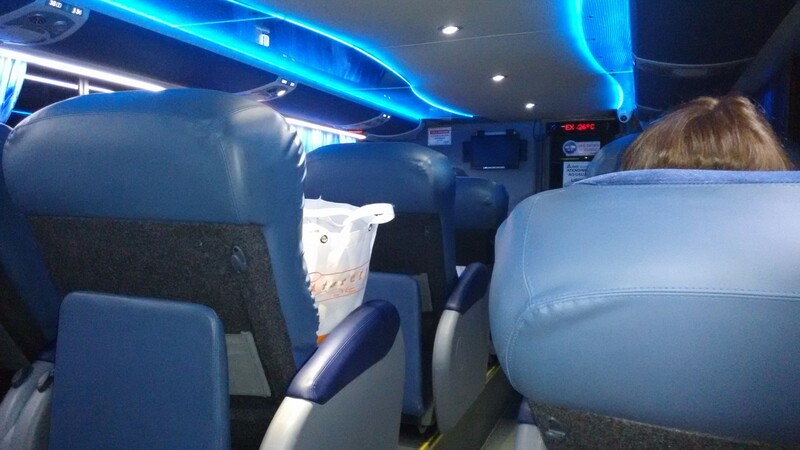 The most luxurious bus I’d seen so far awaited. It’s a bus. It’s comfortable. I don’t know if it was just because we were downstairs on the bus – I’m pretty sure there was no difference in the price of our tickets – but we had the most roomy, wide seats I’ve seen yet. It was time for some sleep. Until I was shaken awake of course. Dazed and confused, I tried to figure out what was going on, aside from the fact that we were supposed to be changing bus. It was too early though, only around 5AM, and something had to be wrong, I just couldn’t put my finger on what. It took a few grunted questions (that’s Spanish! 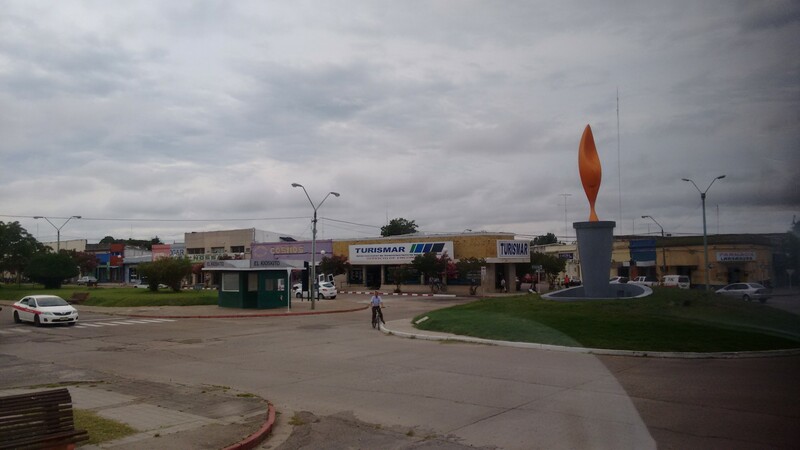 ), but I eventually realised we were in Rivera, just over the border into Uruguay. The bus to Montevideo was there, so we needed to change then, as we may not have had the opportunity in Tacuarembo. Here’s where we should have changed buses! It might have been a rush, but at least we got on it. 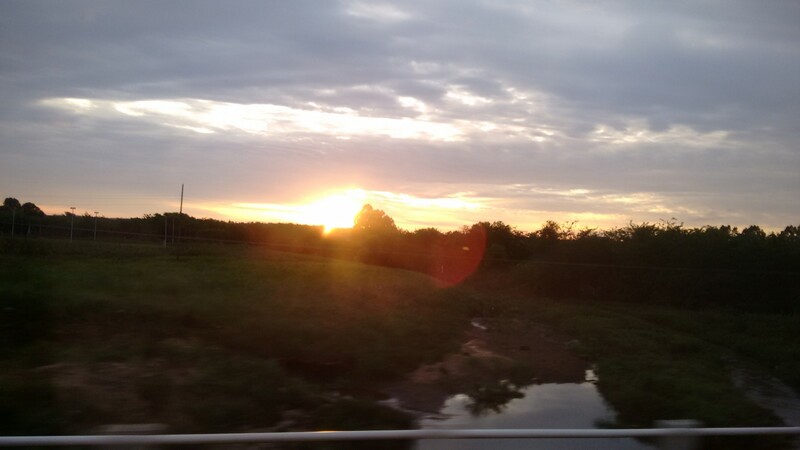 Six hours of Uruguayan interior farmland later, we arrived in Montevideo. After a few insights into the city from Borja, we set off in our opposite directions, and I set off for the hostel. Not only had we negotiated a potential hitch in Porto Alegre, but I’d managed to arrive on the day I intended! Success! I thought it was quite a nice side to a building. I won’t pretend to have done particularly much with my time in Montevideo. While its a perfectly nice city, it didn’t appear to me to be any more interesting than most of the rest out there, and a lack of interest led to my not even going to the old town till after new year. This itself was good though. A top down analysis of a beach. After going out to eat asado, the favoured dish of Uruguay it seems (really nice steak essentially), with them a couple of nights beforehand, I spent New Year’s Eve with Isobel, Ailsa and Zach. All three were students at Oxford university (travelling is supposed to be about experiencing other cultures to be fair! ), the girls on placement years in South America, and all three had met up to visit Buenos Aires and Montevideo before going back. After a few beers we made our way to the bars, which had been spilling out onto the streets the last time we saw them, only to find nothing – nada. Everything had closed. On New Year’s Eve! Fireworks light up the beach. 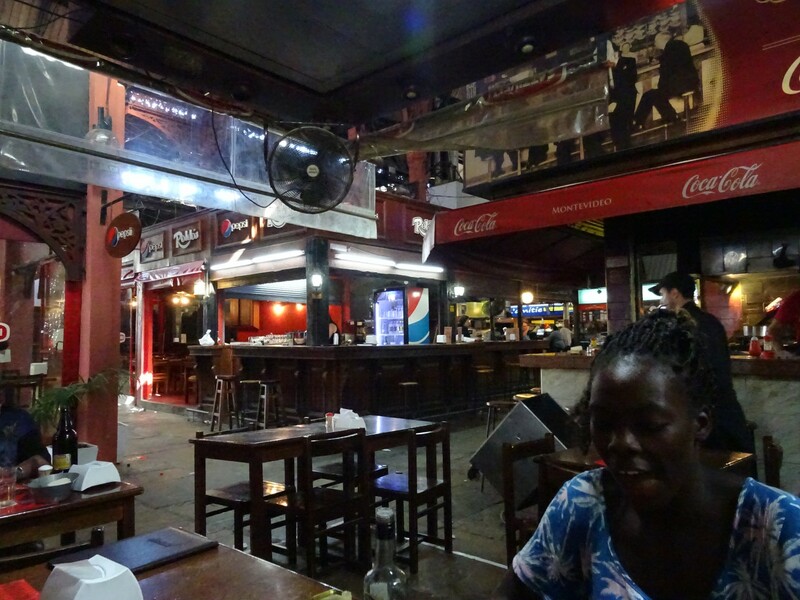 It was all rather ominous, but we found one place that was still open – a small bar on the beach. 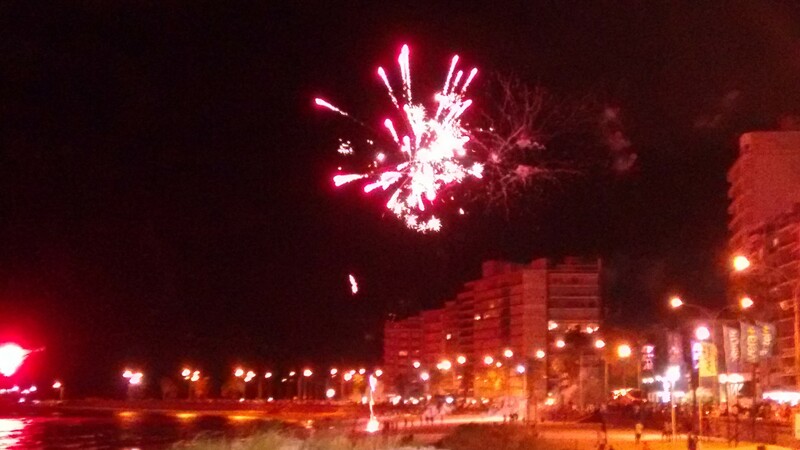 Caipirinhas in hand, we watched the fireworks over the Rio Plata, along with the rest of the now sizeable crowd. Only one last thing was needed to bring in the new year – a dip in the water. This is the second, and more successful attempt at a group selfie. I’m not a natural. New Year’s Day left the city deserted, like a scene from 28 Days Later, and it didn’t get much busier in the days after either. It turns out everybody here has holidays in the first two weeks of January, off to the beaches further east, so not much is open. Aside from a stroll down the boardwalk, and a look around the old town, there doesn’t seem much to do in the area. Having said that, this could be explained as a growing ambivalence toward most cities, so may be slightly unfair. 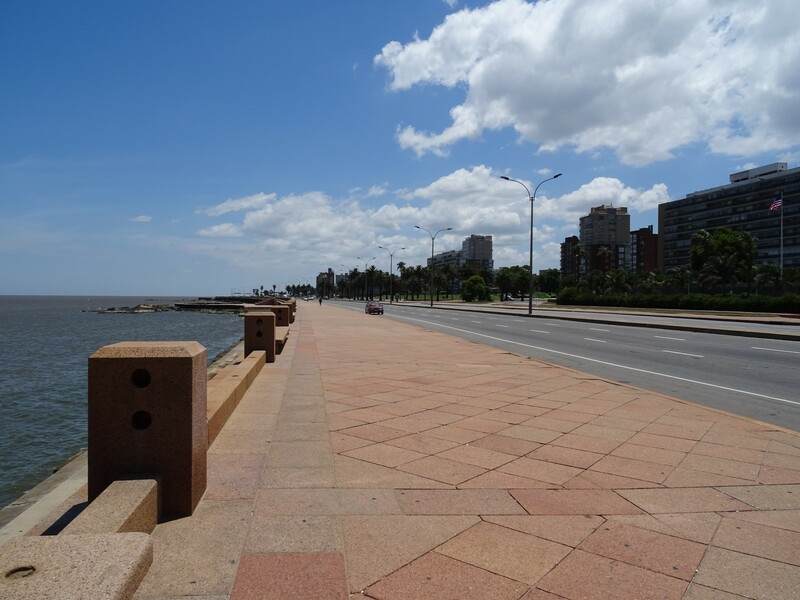 I was tempted to strike out toward Punta del Diablo, which everyone I met seemed to be heading to, but I had a deadline to meet which would mean I’d spend more time travelling than actually being there, so in somewhat unadventurous fashion I decided to stay in Montevideo. To be really clear and with utmost honesty, this definitely did not involve another cinema trip at all. I did not see “The Hateful Eight” and this is not the fourth South American country I have been to the cinema in. Any blame I lay at the feet of Marc, who invited me, but that statement is not to be taken as an admission of guilt on my part. It’s worth seeing though. Asado in an empty market. While I did feel a little guilty for staying instead of exploring more of Uruguay, such is the price of forward plans. Exciting forward plans, too. 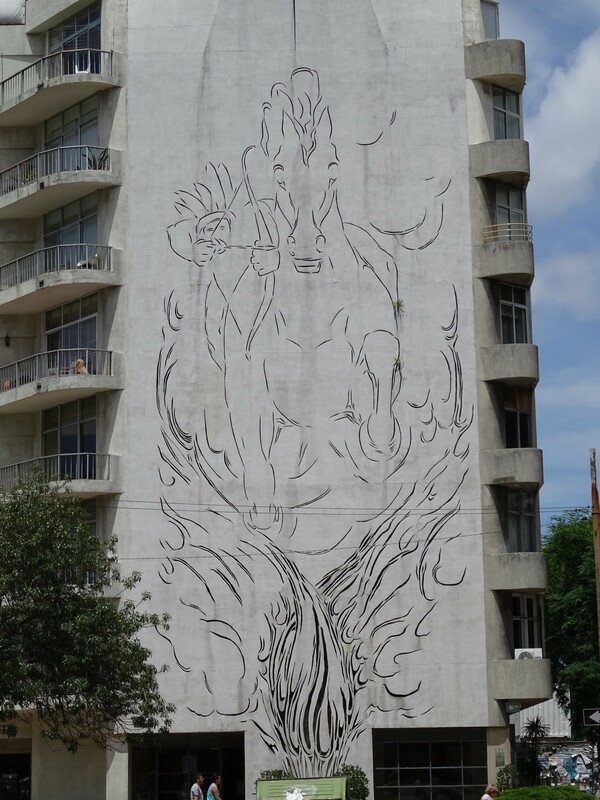 In two days time I head back into the heart of Uruguay for a bit of adventure again. Adventure on an estancia. 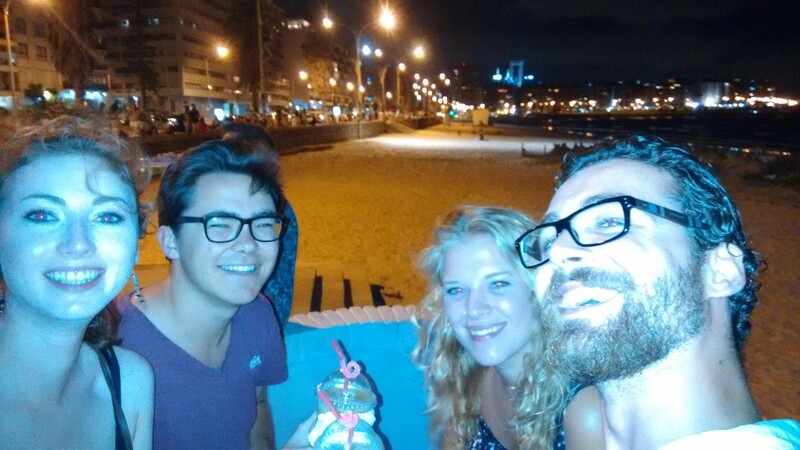 Beaches, Border Crossing, Bus Travel, Caipirinhas, Cinema Abroad, City Exploration, January 2016, Tasty Food. Bookmark.